Figs are packed with fiber, vitamins, nutrients, and sweetness. If you have ever had a fresh fig off a fig tree, then you know why we love them. This sweet fruit is from the ficus tree, which is part of the Mulberry family. Dried figs can be found year-round but fresh figs from California can be found from June to September and some European variations are available through fall. Turkey, however, is the biggest dried fig producer and exporter in the world. They are actually one of the oldest known fruits and are native to the Mediterranean and parts of Asia. They were so revered by the Greeks and the Romans that the Greeks created laws forbidding their export and the Romans thought they were sacred fruit. They are sweet and have a chewy texture with edible seeds. Fresh figs are delicate and perishable, which is why dried figs are often preferred. They vary in color and texture and when dried the process is either by sunlight or through an artificial process that does not harm the nutrients. Figs are full of both soluble and insoluble fiber, which may reduce some types of diseases. 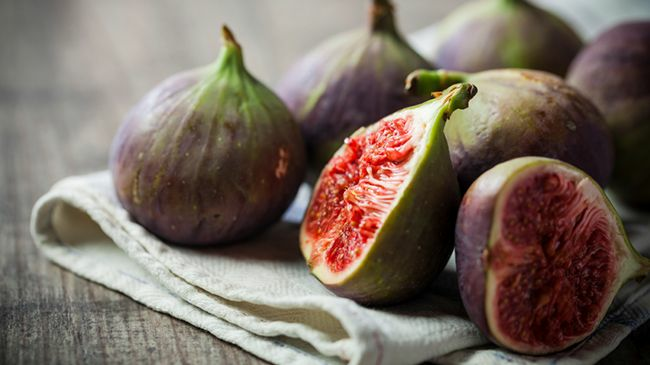 They are excellent source of potassium, natural sugars, calcium, magnesium, iron, copper, and vitamins A, E, and K, according to the California Fig Advisory Board. They are also known for lowering blood pressure due to the potassium and low sodium along with high levels of polyphenol antioxidants. Figs contain omega-3 and omega-6 fatty acids and phytosterol compounds, which help to lower cholesterol and the fiber actually binds to the cholesterol helping to rid it from the body. Figs are rich in vitamins C and E, which fight hair loss. Vitamin K helps to maintain healthy hair and magnesium plays an important role in slowing down and even stopping hair loss. The high amount of calcium in figs contributes to the formation of collagen, which is a major component in hair growth. Figs are nothing new to the hair care industry and have been used to create conditioners and detanglers. They are gems to curly, wavy, and coily girls because they hydrate the hair and even provide some shine. What's better for your hair? Ounce for ounce, dried figs have higher vitamins, minerals and dietary fiber than fresh figs but fig oil is excellent at moisturizing and nourishing with its emollients that soften and smooth the scalp and hair. Not to be confused with barbary fig oil, which comes from the cactus Opunita ficus-indica and is also great for hair. Fig seed oil contains essential fatty acids oleic, linoleic, linolenic, palmitic, stearic, and arachidic and is an effective lubricant for skin, scalp, and hair. It would seem that either eating the figs or even using the oil topically can benefit our tresses but if you are not fans of either than I still have you covered! Here are some products that contain the coveted fig seed oil or extract and you may be surprised to see a couple you have heard of or are already using!